We have no schedule at all. Only two weeks after the last day of school, and I’m already in a daze. (What day is it again?) Being at home with my girls makes me happy! Summer days bring about all kinds of happy happy joy joy, which is what Gretchen at Second Blooming wants to know about this week. Summer means ice cream, popsicles and fresh fruit. Juicy peaches and red, red strawberries. Plump blueberries and tart cherries from Michigan. Farmer’s markets and fresh salad on the table. Grilling most meals so that we don’t heat up the kitchen; less pots and pans to wash. Hamburgers, hot dogs, brats, served with garden fresh tomatoes and green onions and lemonade. Everyone comes out to play in the summer. In the winter, we hibernate; we bundle up with blankets and sit on the couch. But as soon as the weather gets warm, the neighborhood comes alive. The playground is full of running, jumping and screaming kids. Neighbors walk by and stop to chat. Bedtime gets later and later each night because the sun doesn’t go down until well after 9 o’clock. Bursts of red, yellows and pinks bloom in gardens. The bright colors make cold February seem like a distant dream. The pool is finally open, and in the afternoon we can go swimming for an hour or so. 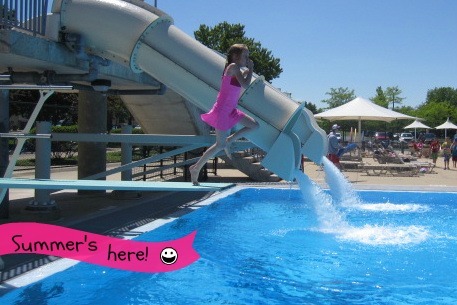 Jump into that cool, blue chlorinated water under a hot sun to splash around with the kids. At safety break, we bundle up in towels and sit on lounge chairs, almost too tired to move. Until we remember that an icy pop is only a quarter at the snack stand! Don’t forget summer road trips. Roll down the windows and turn up the radio! Sing at the top of our lungs, play the alphabet game, have a snack, and then wonder how much longer. Tumble out of the car when we get there and get hugs and kisses from waiting relatives. Spend some time away from the worries at home and just relax. ← Facebook okays mastectomy photos: Is it really okay? I feel badly for how much I don't like winter. I hope my kids don't notice it! I am generally happy all year but there's something about summer. It is just that good. My recent post Ladies Only Blog Share Link Party: Funtastical Summer. Ah! This post is SO filled with happiness and joy! And that picture! Love it! Daily summer "garden checks" with my kids. For them, ages 4 and 2, watching a tomato grow day by day or picking one blueberry at a time in the evening (only when dad gets home fom work – it must be shared with him!) reminds me that their small, focused viewing of the world is MUCH better than my adult, "big picture" vision. Oh, I love this! (Of course you have to wait for Daddy to come home!) Thanks for commenting, Christine!